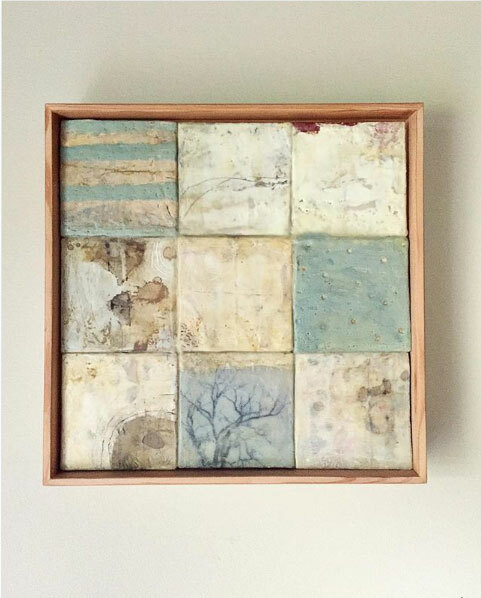 This painting consists of nine 4×4 inch panels that are all attached together to form a whole. When I was creating the smaller panels I was only focusing on that actual panel, not yet thinking of the whole. And I was thinking about quiet during a recent week of so much raw emotion in our country. I was thinking about what each of us goes through in life as we walk this planet. What we endure, what we love, what makes its marks on us. Being alive is a sensual thing, what we take in and feel and see and touch and taste and hear. You would think this would make us more empathetic to each other. Awareness leading to empathy…you would think. I found this poem by Joan Harjo tonight that I want to save for myself and to share for whomever happens to land on this page. Remember the sky that you were born under, know each of the star’s stories. Remember the moon, know who she is. Remember the sun’s birth at dawn, that is the strongest point of time. Remember sundown and the giving away to night. Remember your birth, how your mother struggled to give you form and breath. You are evidence of her life, and her mother’s, and hers. Remember your father. He is your life, also.Remember the earth whose skin you are:red earth, black earth, yellow earth, white earth brown earth, we are earth. Remember the plants, trees, animal life who all have their tribes, their families, their histories, too. Talk to them, listen to them. They are alive poems. Remember the wind. Remember her voice. She knows the origin of this universe. Remember you are all people and all people are you. Remember you are this universe and this universe is you. Remember all is in motion, is growing, is you. Remember language comes from this. Remember the dance language is, that life is. Remember.